The standing desk is supported by legs cut from heavy steel plate. They are braced by a formed aluminum shelf, and tie rods lock the structure into a rigid assembly. The desk is available in one-inch height increments, between 36 & 46 inches. Desktops are 30" deep and 40" wide, of quartersawn clear white oak with a hardwax oil finish. Sealants are applied over natural metal finishes. 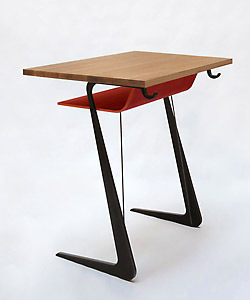 Desks are also available with satin black legs and a powder coat gloss red aluminum shelf. Width 30" Length 40" Height 41"
Available in heights from 36" to 46"